Having just completed a unit where I felt the students had a great understanding of the central idea, I was struck by a horrifying thought. I wasn’t entirely sure how that happened. How could I use this experience to help me in the future? In some ways, the reflection that takes place after a successful experience can be more important than the reflection that takes place after a disastrous experience. I’ve made pancakes for my daughter so many times and I can count on one finger the number of times I’ve done it well. In fact I can write a book about all the things not to do when making pancakes. Of course I wasn’t paying attention that one time the pancakes were actually edible so my poor daughter is destined to eat burnt and crispy pancakes for the rest of her childhood. All the disastrous experiences don’t necessarily show you the right way to do something. So I went about searching for an answer. When I analyzed everything our class had done I noticed that we had completed far more check-ins for understanding than usual throughout this unit. When I say “checking-in” I simply mean taking the time to talk to my students about how they’re going. Checking-in in our class can happen very informally. For instance, if we have a few extra minutes I might just ask the students to look at our lines of inquiry and central idea, and tell me what they’re still trying to figure out or ask what they want to spend more time looking into. Another idea the students really like came from my friend and fellow Inquiring Minds contributor, Adam McGuigan. 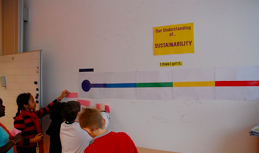 It is simply a massive thermometer posted on the wall attached to a teacher question, concept or line of inquiry. The students post their answer to the question along the thermometer based on their own perceived level of understanding. The students can revisit this thermometer throughout the unit and adjust their level of understanding. One of the most powerful moments in our recently completed unit focusing on beliefs and values was a simple task of analyzing student questions and having the children sort them into groups. We realized that a lot of children were still struggling to explain how they express their beliefs and values. It was at this point that one child raised their hand and explained that they were Muslim and they showed this by going to the mosque every Friday, praying at home every day and reading the Quran. All of a sudden children were raising their hand wanting to explain how they expressed their different beliefs and values. This went on for 15 minutes. The next day we followed up this conversation by trying to match beliefs and values with the ways in which we might express them. We used many of the examples from the day before. When we checked in again a few days later the children felt so much more confident in their understanding of the lines of inquiry and central idea. In my mind checking-in is more than just formative assessment. The key component is actually listening to children. It’s not just about finding out what they know and what they don’t know. It can also lead you in new directions and it provides children with an opportunity to help each other in their journey towards understanding. I would love to hear how others check-in. It should be noted that my wife is a fine maker of pancakes.